John and Gerry Whalen consider it an honor and privilege to be associated with Thursday's Child, Inc. They appreciate the support and assistance available and understand the importance of supporting adoptive families. They were fortunate to be able to adopt near the beginning of the Special Needs Adoption Program (SNAP). They say their lives have been amazing journeys, exciting adventures. In 1978, they became foster parents. They had no parenting knowledge or experience when the mother of two boys in their small community died in an auto accident. The boys were only four and six years old. They needed a home so they moved into the Whalen residence. Two years later, a son was born. March 1982 was a wonderful month with the adoption of their foster sons and the birth of their first daughter. Another son was born in 1983 and three more daughters were born in 1990, 1993, and 1997. 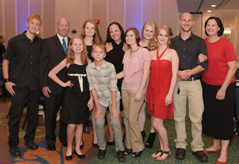 In addition to these eight children, over seventy foster children have become a part of the Whalen family. John and Gerry have completed the requirements to be foster parents every year since 1977 and their home remains open today for foster placements. After 15 years of marriage, we were encouraged by Jonathan's sister, Joyce, to look into foster care and adoption. Joyce had been a foster/adoptive parent for over 25 years, and we had always said we could never do it. We could never love those kids and then let them go. We decided to call just to check it out, and found out that classes were starting the very next week. Was this meant to be? We went to the informational meeting, and decided that maybe we could do it. We signed up for classes, still unsure if this was for us. We completed the training, and got our first placement in September 2010. Over the next 6 years, we had a total of 9 children. Six of them came and went, and yes…it was hard, but we knew that we made a difference in each child's life during the time that we had them. Whether it was for a few days, or a few months, we provided love and stability when they needed it the most. Three of the children that were placed with us became ours forever. Nathaniel, now 10, came to us at 3 years old, and was adopted in August 2012. He is kind-hearted and very athletic, a star on his basketball and flag football teams, and the fastest kid in his grade. Audreana is 5 now, and we brought her home from the hospital at 3 days old. She was adopted in June 2013. Ahhh, what to say about Audreana? She is beautiful, determined, and bossy - definitely our little diva. Christian has also been with us since he was 3 days old. He is now 4, and was adopted in September 2016. Christian is a helper at heart. He has a solution for everything and will always chime in with his advice, whether you want it or not. Our forever family is complete. So many people tell us that these kids are lucky to have us, but no…we are lucky to have them. Hello. My name is Kristina Harrison. were understandably devastated.They loved me and knew they could not bear to stick around to watch their newborn daughter die. My parents decided to relinquish their parental rights and walk away. This single act let me know their love for me. They knew they could not watch me die and, if I lived, they could not care for my enormous medical needs. One of the doctors who worked on my case knew of a lady in Mount Vernon, Kentucky who took care of kids diagnosed with a terminal condition. He called her and set up a time to come see me the following day. This lady, Judy Harrison, drove three hours to meet me. As she walked into my hospital room, she saw a little black girl with big brown eyes. As I saw this white woman looking at me in awe, our eyes locked. From that moment we were to be inseparable. Three weeks later Judy took me home as her daughter. 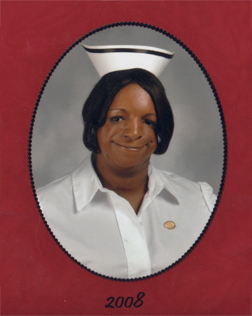 My medical care was meticulous and stressful but she never gave up and knew I was strong enough to overcome the negative prognosis I had been given. I have endured 32 surgeries, countless trips to the doctors, days on end in the hospital and chronic pain. I have overcome all those challenges and surpassed the terminal prognosis I was given 27 years ago. I am now a pediatric Registered Nurse. I work at Hospice of the Bluegrass with children who have been given a terminal diagnosis. I hope and pray my young patients can teach their doctors that even with a terminal diagnosis they are strong and can endure more than most adults could ever imagine. Unfortunately, these patients of mine will pass away most of the time. Still I hope and pray, while these little angels are here on earth, they teach the medical staff and society that children are surprisingly resilient and define the meaning of hope. beginning of adoptions for this couple. After the adoption of Jacob and Jeremy, the couple took in a 16 year old, Tim, for adoption. He was 17 years old when the adoption was finalized. The couple continued to provide foster care to children who included a sibling group of three and another girl that her pre-adoptive placement disrupted. Needless to say, they adopted all four of these children as well. They went from have four adult children to seven school aged children. 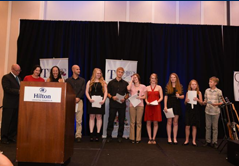 Donna and John are now the proud parents of seven teenagers which includes Tim—age 19, Jessica—age 16, Cheyann—age 14, twins Jeremy and Jacob—age 13, Little Jacob-age 13, and Hannah—age 12. 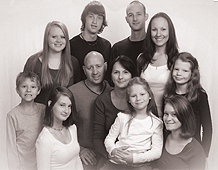 Donna and John Bailey provide unconditional love to each of their seven children, as well as their four adult children. They are constant advocates for the children and provide a loving and nurturing home for them. The couple also gives back to the community by advocating for others to become foster/adoptive parents, they are mentors to newly approved foster/adoptive parents, and they advocate for birth parents and provide support to them when appropriate. The Bailey's are truly an amazing family and anyone who has to pleasure to spend time with them will know their dedication and love they have for others and the children that have become a permanent part of their family. We are Family Video So Inspiring! "From early on in their family's journey, Ken and Loralee knew they wanted more than the typical 2.5 children found in the average American family. They never imagined, however, that the magic number would be nine. 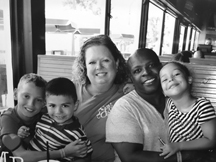 Their foster and adoption story began after their two birth children were school-aged. 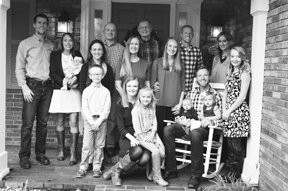 Over the years, they have fostered over 30 children and adopted seven. Although the Ridges have been united from various backgrounds and situations, they have grown to understand that family--above all--is a choice of the heart."